Genetics have always played a huge role on our health foundation. 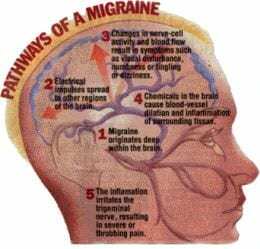 “A research team led by a Howard Hughes Medical Institute investigator at the University of California, San Francisco has identified a genetic mutation that is strongly associated with a typical form of migraine. In a paper published on May 1 in Science Translational Medicine, the team linked the mutation with evidence of migraine in humans, in a mouse model of migraine and in cell culture in the laboratory. The mutation is in the gene known as casein kinase I delta (CKIdelta).